Young Living’s proprietary Thieves® essential oil blend was inspired by the legend of four 15th-century French thieves who formulated and wore a special aromatic combination of clove, rosemary, and other botanicals that they believed provided protection while they were robbing the dead and the dying. French authorities recognized that there was such value in this mixture that upon the thieves’ capture, they received a more merciful punishment on condition that they divulge the ingredients in their secret formula. Crafted in the spirit of that legendary combination, Young Living’s one-of-a-kind Thieves blend can be found in all of our Thieves® products. Possibly our most versatile and beloved blend, Thieves®, with its many benefits including cleaning power, is an important ingredient in our home cleaning and personal care products, replacing harsh chemicals with 100% pure essential oils and other naturally derived ingredients. Featuring the powerful essential oils Lemon, Clove, Cinnamon Bark, Eucalyptus Radiata, and Rosemary, Thieves® imparts a spicy, welcoming aroma everywhere it’s used and is known for supporting good health and total well-being. Cinnamon Bark essential oil’s familiar aroma comes from the naturally occurring constituent cinnamaldehyde, which plays a key part in the signature spicy aroma of Thieves®. It effectively eliminates odor and freshens musty-smelling areas. Clove essential oil, nature’s richest source of eugenol, is the highest scoring single ingredient tested for its antioxidant capacity on the ORAC scale. Eucalyptus Radiata essential oil has a cooling, refreshing, and energizing scent. Because it is relatively gentle and non-irritating, it is the preferred choice for children. Lemon essential oil is known for its ability to act as a natural solvent and cleanser. It consists of 68 percent d-limonene, a powerful antioxidant. Rosemary essential oil has a fresh, sweet, herbaceous aroma. It is naturally energizing and may be beneficial for helping restore mental alertness. Keep feet fresh! Rub Thieves on the bottoms of your feet before heading out for the day to support overall wellness. Diffuse Thieves to create a warm, clean atmosphere virtually anywhere. Give Thieves Household Cleaning products a boost by adding an extra drop or two of Thieves. Ditch the ingredients you don’t want and keep all the results you do—a deep clean, bright teeth, and fresh breath all day long! Infused with Peppermint, Spearmint, and Thieves essential oil blend. No Flouride, synthetic dyes, artificial flavors or preservatives. 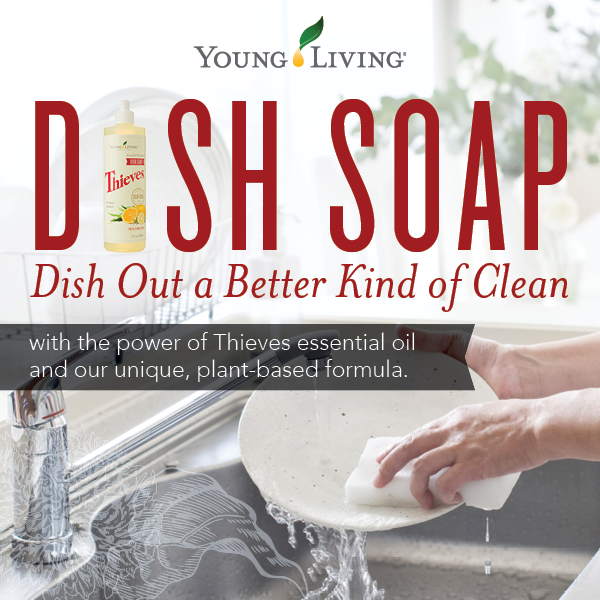 Thieves® Cleansing Bar Soap is enriched with the powerful Thieves essential oil blend, moisturizing plant oils and botanical extract to help cleanse, purify, and promote soft, healthy skin. After using our essential oil-infused toothpaste and floss, follow up with Thieves Fresh Essence Plus Mouthwash! Keep Thieves mouthwash on hand to ensure a deep, whole-mouth clean for the entire family. Blending Thieves, Lemon, and Orange essential oils with other naturally derived ingredients, Thieves Foaming Hand Soap is a gentle and effective alternative to commercial soaps. No sulphates, dyes, synthetic fragrances, or harsh chemicals. Infused with the power of Thieves, Jade Lemon, and Bergamot essential oils, Thieves Dish Soap leaves dishes sparkling clean with a plant-based formula that doesn’t compromise on efficacy. No chemical dyes or synthetics. Thieves Fruit & Veggie Soak is a concentrated formula, crafted with Thieves, DiGize™, and Purification® essential oil blends. To use, mix with water in a bowl or basin, soak produce for 1–2 minutes, rinse, and enjoy. & Veggie Spray is small and portable for convenient use at home, school, or work. Spray onto produce, lightly rub, and rinse. 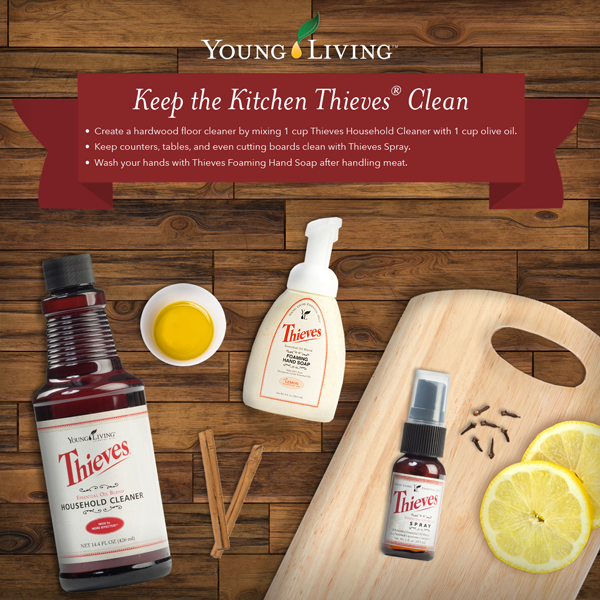 Formulated with the power of Young Living’s Thieves blend, Thieves Household Cleaner provides a deep clean without dangerous ingredients. Wherever you use it, you’ll feel good knowing that this product is safe to use around everyone in your family, including pets. The concentrated, versatile formula makes Thieves Household Cleaner a must- have in any home. Click HERE for great usage tips. 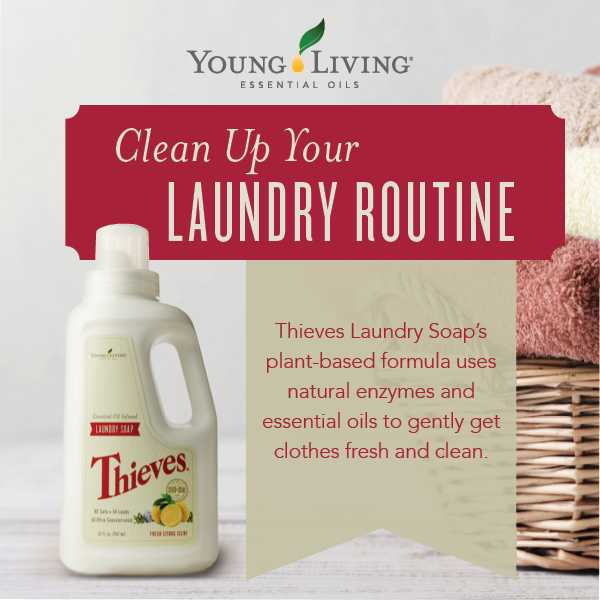 Thieves Laundry Soap gently and effectively washes your laundry with the combined power of Young Living essential oils and natural cleansing enzymes, leaving your clothes, bedding, and linens smelling fresh and clean. Tip: Make your own scented dryer sheets by putting 4–6 drops of your favorite essential oil—like Thieves—on a washcloth and drying it with your clothes. This portable cleaning spray is ideal for small surfaces like doorknobs, handles, and more. By stashing a bottle in commonly cleaned rooms in the house, you can always have Thieves by your side. Thieves Waterless Hand Purifier is enhanced with Peppermint essential oil to cleanse hands. Perfect for freshening your hands while on the go, the waterless formula leaves hands feeling clean and smelling great. Thieves is the ideal blend of Clove, Lemon, Cinnamon Bark, Eucalyptus Radiata, and Rosemary essential oils, its freshening power is welcome in every room of the house! Use Thieves essential oil blend topically or aromatically to enjoy its spicy, comforting aroma. Purification™ Essential Oil is a blend of Citronella, Lemongrass, Rosemary, Melaleuca, Lavandin and Myrtle essential oils. These six essential oils work together to create a refreshing, bright scent that keeps you and your family happy and comfortable. Purification™ can also help to purify and cleanse the air from disagreeable odors, when diffused. Lemon has a strong, clean, purifying citrus scent that is revitalizing and uplifting. It consists of 68 percent d-limonene, a powerful antioxidant. It is delightfully refreshing and may be beneficial for the skin. Lemon essential oil is cold-pressed from the rinds of lemons. Young Living’s DewdropTM Diffuser functions as a humidifier, atomizer, and aroma diffuser in one simple-to-use product. It is custom designed with up to four hours of continuous run diffusion, automatic shut-off and ambient light control. This diffuser comes with free 5ml bottles of Lavender and Lemon essential oils. *Enjoy Member Price by becoming a Young Living Member. Click HERE to see how. Buying this kit enrolls you as a Young Living Member and allows you to enjoy member prices and a lot more! This handy starter kit ensures the benefits of this revolutionary essential oil blend are always on hand. The purifying action of Thieves essential oil is available in a wide variety of products for the home, including oral care, cleaning products, and aromatherapy, all in the convenience of one kit! I Want This Kit Now! Enjoy shopping at member pricing – 24% off retail price! FOR INQUIRIES, CALL 6391 0170 or EMAIL ORDERS.SG@YOUNGLIVING.COM. Young Living Singapore offers free classes at the Young Living Singapore office. Learn how to detoxify your home with Thieves® or find out more on the use of 100% pure essential oils from Young Living at any of our workshops. Click for more details. Book your seats through MINDBODY Connect for registration or email events.sg@youngliving.com if you have any enquiries. Stay up to date with all events coming straight in your mailbox! ©2017 Young Living Essential Oils. All rights reserved.